The PuTTYgen program is part of PuTTY, an open source networking client for the Windows platform. Download and install PuTTY or PuTTYgen. To download PuTTY or PuTTYgen, go to http://www.putty.org/ and click the You can download PuTTY here link. 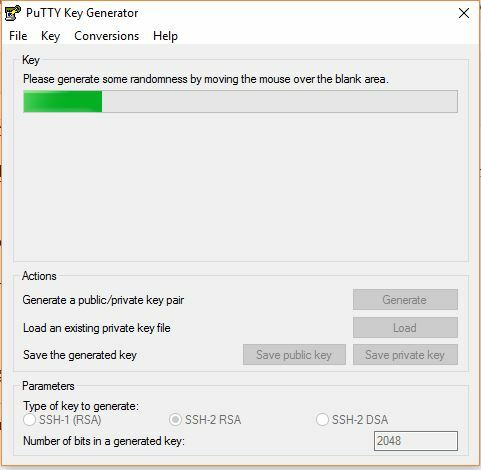 The PuTTY Key Generator window is displayed. Click Generate to generate a public/private key pair. As the key is being generated, move the mouse around the blank area as directed. 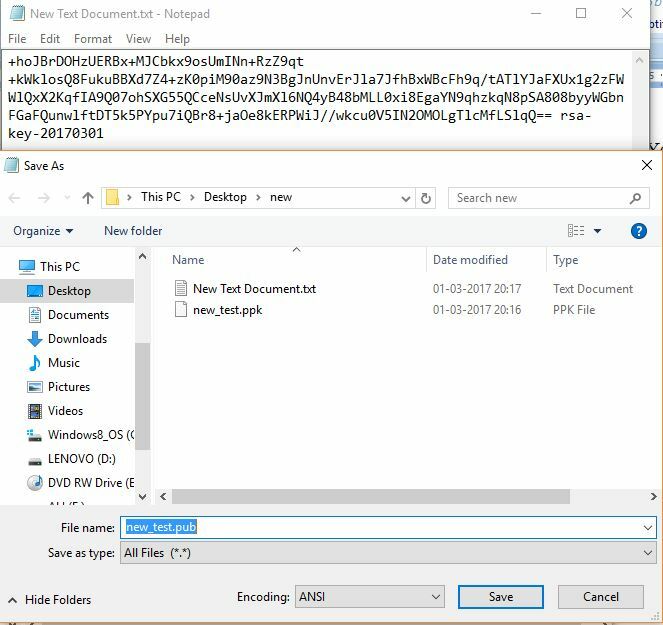 Click Save private key to save the private key to a file. To adhere to file-naming conventions, you should give the private key file an extension of .ppk (PuTTY private key). The .ppk file extension indicates that the private key is in PuTTY’s proprietary format. You must use a key of this format when using PuTTY as your SSH client. It cannot be used with other SSH client tools. Refer to the PuTTY documentation to convert a private key in this format to a different format. Select all of the characters in the Public key for pasting into OpenSSH authorized_keys file box. Make sure you select all the characters, not just the ones you can see in the narrow window. If a scroll bar is next to the characters, you aren’t seeing all the characters. On the Conversions menu, choose Export OpenSSH key . 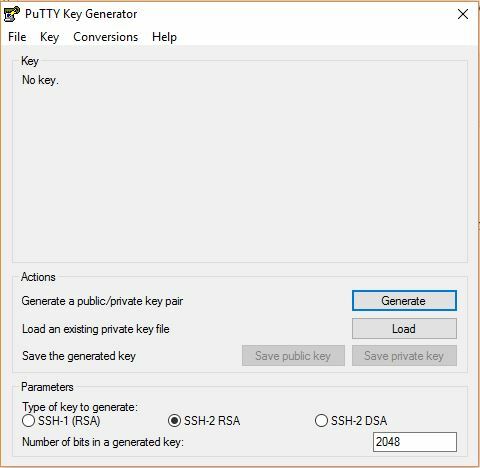 Save the private key in OpenSSH format in the same folder where you saved the private key in .ppk format, using an extension such as .ssh to indicate the file’s content. 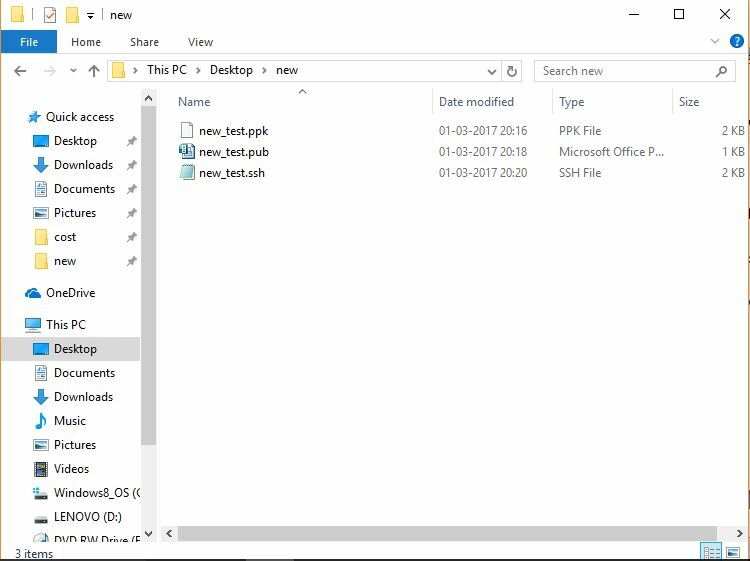 Now we have all required key in one folder.